AzhwAr when asked whether the entity who had entered him wilfully, both inside and outside, is a simple person, says that he is the supreme being! thAnE thanakku uvaman – he can be compared only to himself. There is none other than himself for comparison. Another entity can be compared to him only if there is another ISvaran! Hence, only he can be compared to himself. 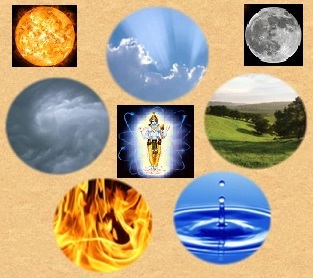 than uruvE evvuruvum – bruhadhAraNyaka upanishath 5-7 says “yasyAthmA SarIram yasya pruthivI SarIram”; SrI vishNu purANam 1-22-86 says “thAni sarvANi thadhvapu:”’ SrI vishNu purANam 1-22-38 says “thath sarvam vai harEs thanu: “; SrI rAmAyaNam yudhdha kANdam 20-26 says “jagathsarvam SarIram thE”. As mentioned by all these authentic sources, he has the entire universes as his physical form. The reason for having none to be compared with him is because he is the substrate for all other entities and he does not have a substrate for himself. In other words, all other entities are his physical body. thAnE thava uruvum – all the higher level purushas (souls) such as brahmA et al are his attributes, since they attained their exalted physical forms after carrying out penance [directed at him] for a long time. mahAbhAratham sabhA parvam 14-8 says “yugakOti sahasrANi vishNumArAdhya padhmabhU: punas thrailOkya dhAthruthvam prApthavAnithi SuSruma:” (we hear that brahmA carried out penance for thousands of yugams (ages) towards vishNu and worshipped him and attained the post of brahmA, the head of the three worlds). The same is true of rudhra too, as mentioned in mahAbhAratham SAnthi parvam 20-12 “mahAdhEva: sarvamEdhE mahAthmA huthvAthmAnam dhEvadhEvO babhUva” (Sivan, the mahAdhEva (greatest among celestial entities) offered himself in the sarvarmEdha yAgam (a sacrificial ritual) and became the head of celestial entities). Thus, all these entities obtained exalted physical forms after carrying out penance over a long period of time towards emperumAn and became part of his physical form. thAragaiyum thAnE – stars are also his attributes. By mentioning brahmA and Siva in the previous verse and stars in this verse, AzhwAr says that both sentient entities and insentient entities are his physical form, without any distinction. iru sudarum Aya ivai – light emitting objects such as sun and moon in each of these universes are his attributes and are under his control. iRai – emperumAn who is all these entities, is his own equivalent [and there is none to compare with him]. We will move on to the 39th pAsuram next. This entry was posted in iyaRpA, mUnRAm thiruvandhAdhi on April 6, 2018 by T N Krishnan.